Grammar is a subject that many children find frustrating, but Sentence Buildings by Learning Resources makes learning sentence structures fun. With Sentence Buildings, you create sentence cities with nine buildings that teach parts of speech and you have over 300 double-sided cards that are color-coded to their appropriate buildings. The buildings are each labeled with noun, verb, adjective, pronoun, conjunction, article, preposition, adverb, and punctuation and are filled with their respective cards. Quinn is in kindergarten, so some of these were a bit advanced for him (recommended for 1st grade and up), so we really only used noun, verb, adjective, pronoun, and punctuation for his lessons with the buildings. Nonetheless, these turned the task of learning the English language into something fun and entertaining, not boring and drab. Avery, however, is old enough at 10 years old to learn all these, so we spent lots of time going over all the parts of speech together and he enjoyed making sentences by pulling out the cards and found some of our sentences to be quite hilarious. As a mom and teacher myself, I think this product is amazing. Instead of children being bogged down with the boring stuff that comes with language arts, these turn it into a game, of sorts. And, like all Learning Resources products, these are geared to children with bright colors but are also made to last. With proper care, these will work for children for years and years. 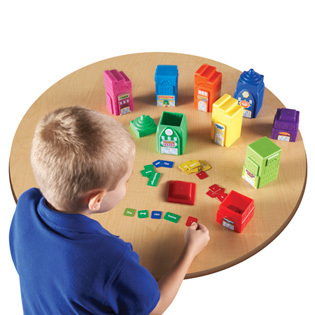 You can purchase Sentence Buildings at many major educational supply and toy retailers nationwide, such as Amazon.com and Toys"R"Us, as well as on their website, www.learningresources.com. This set retails for approximately $29.99. Thank you to Learning Resources for providing a complimentary product sample for us to base this review upon and for providing an additional product for our contest prize.